A team of Hungarian engineers have created the ultimate fire extinguisher. 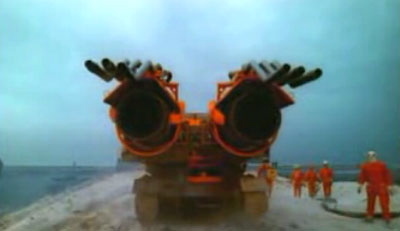 They've removed the gun turrets from an old Russian tank, replaced them with 2 turbines from a MiG-21 fighter jet, and injected the whole thing with gallons of water. The result is the first ever jet-powered fire extinguisher. Though it'd be difficult to get the tank to confined spots, the turbines' speed and power could potentially help firefighters with oil-fires, which typically take days to extinguish. Hit the jump for a video of the world's biggest Super Soaker in action.